With over 50 awards and nominations, Sekiro™: Shadows Die Twice is the next adventure from developer FromSoftware, creators of the Dark Souls series. Carve your own clever path to vengeance in this all-new action-adventure title. In Sekiro™: Shadows Die Twice you are the 'one-armed wolf', a disgraced and disfigured warrior rescued from the brink of death. Bound to protect a young lord who is the descendant of an ancient bloodline, you become the target of many vicious enemies, including the dangerous Ashina clan. When the young lord is captured, nothing will stop you on a perilous quest to regain your honor, not even death itself. Explore late 1500s Sengoku Japan, a brutal period of constant life and death conflict, as you come face to face with larger than life foes in a dark and twisted world. Unleash an arsenal of deadly prosthetic tools and powerful ninja abilities while you blend stealth, vertical traversal, and visceral head to head combat in a bloody confrontation. Take Revenge. Restore your honor. Kill Ingeniously. ©2019 FromSoftware, Inc. All rights reserved. Published and distributed by Activision. ACTIVISION is a trademark of Activision Publishing Inc. All other trademarks and trade names are the properties of their respective owners. 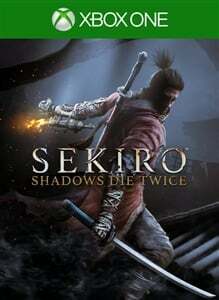 Dark Souls is a trademark of BANDAI NAMCO Entertainment Inc. Bandai Namco is not the publisher of SEKIRO: SHADOWS DIE TWICE. Activision has no affiliation with Dark Souls.